As the sun sets on another strawberry season, sweet cherries are now coming into season. 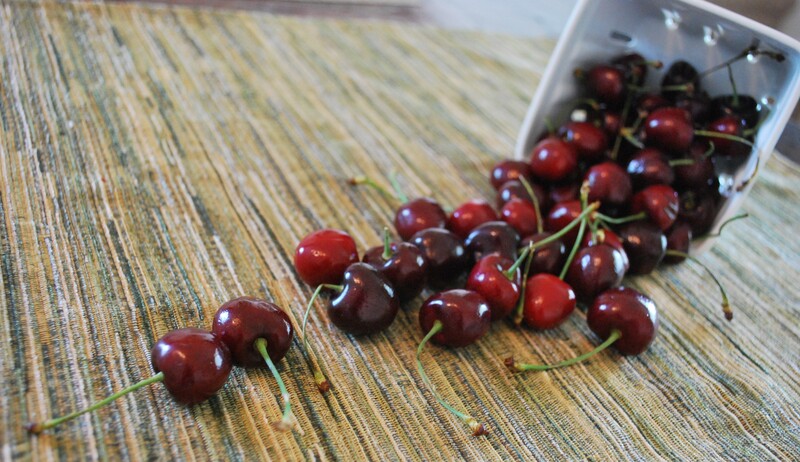 My husband loves sweet cherries and I was looking for something to do with some aside from desserts like cobbler and pie (because, let’s face it, we’ll eat the whole thing ourselves…or I’ll take it to work. Which my new co-workers have playfully dubbed my joining the team ‘the Virginia 15’). And, let’s face it- it’s hot. I did not want to turn on the oven in this heat. So I set out to find something savory to make with sweet cherries. I found a number of delicious sounding things (one involves brie, a favorite in our household…if only I can refrain from eating the next wheel before I make time to try something new…). I settled on Sweet Cherry Barbecue Sauce and started thawing some ribs. This sauce is ridiculously easy and received several comments throughout dinner from my husband about it being very good, so I’d call it a success! In a medium saucepan, saute the onion and garlic (with some salt) until soft. Add the cherry puree, ketchup, brown sugar, orange juice, and cider vinegar. Cook over medium-low heat to thicken. Salt and pepper to taste (I used at least a half teaspoon of each, probably more) and add more garlic if you love garlic like we do (I used probably another half teaspoon of granulated garlic). Puree with an immersion blender, in a blender, or in a food processor until smooth. Serve up with your favorite dishes! And, well, don’t expect it to last long enough to get pictures of anything but sauce-smeared plates! Next Next post: Knee High by the Fourth of July!